Every year we look forward to the wild blueberries which abound at a local conservation land. We pick 4 quarts (yes, it takes a while), make jam out of 1/2 and freeze 1/2 for pancakes throughout the year. This year, with the kids away, I decided to drive up there and check out the berries. I figured that with all the rain they'd be late but that otherwise we could look forward to a family outing. 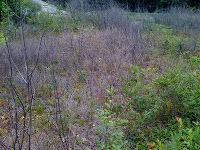 The blueberry shrubs were bare. Not just "no berries" - NO LEAVES. Nothing. The area I usually go to was completely dead. No evidence of a fire either. I don't get it. I managed to find some bushes by traveling around a lot more than I usually have to, and in 4 hours (yes, I'm persistent) I picked 3 pints. They didn't taste very sweet. 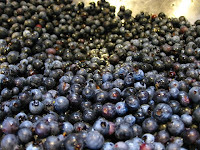 I brought them home and we decided that I should make jam, and just buy frozen berries if I want them for pancakes. At least with the jam they'd have sugar in them. Since I didn't have enough to make a standard CERTO batch, I brought out the Pomona's Universal Pectine and made a low sugar, slightly smaller batch. 1 pint and 2 half-pints, plus a little in the fridge. I have dubbed this jam, "Break-Your-Heart Blues." I have been trying to find out what happened to the bushes. I emailed a local arboretum and they weren't really sure. I have an email out to the conservation department but haven't heard back. Thank you so much for the care package of jams! We have opened the spiced plum, which is delicious! I put it on everything. I am so excited to try the others, too. Delish! You're welcome! Glad you're enjoying them! The latest theory is that the power company used herbicide to keep the access to the power lines clear. This is after talking with the arboretum, a park ranger and other park staff at another park, and some purveyors of local produce. It doesn't make a whole lot of sense, since there were wide open paths and the power lines were up on boulders which did not require clearing. But we'll just have to keep checking back over the next year or so and see how things go.